Equestrian Crossings hosted the research and riding session at the Rein Shadow Arena in Greenbank. 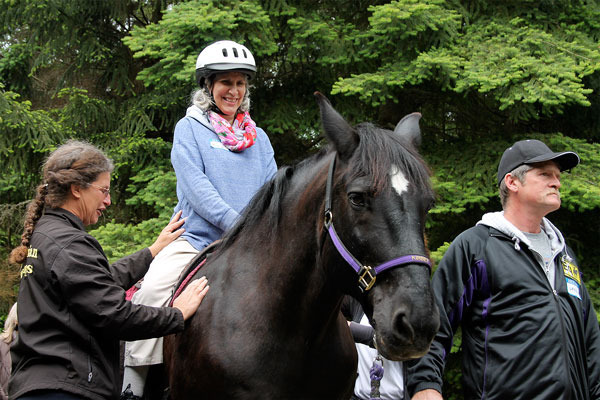 Multiple sclerosis patients from Swedish Medical Center in Seattle made the journey from the Emerald City as part of the hospital’s new wellness program that provides therapy through engaging activities such as music, art and horseback riding. Research is being conducted by occupational therapists from Swedish Medical Center in the six-week program. Depending on their findings, this could lead researchers to seek grant money to extend their studies on therapeutic riding for multiple sclerosis patients. The research session is the brainchild of Langley resident Catherine Cesaro, who herself receives treatment for her multiple sclerosis at Swedish Medical Center. She is also on the board of directors for Equestrian Crossings and owns two horses, one of which is a therapy horse. Studies on the impact adaptive horseback riding can have on multiple sclerosis patients are quite rare. “Adaptive” riding is the term used for riding that enables those with physical or mental conditions to ride with varying levels of assistance. Equestrian Crossings uses ramps to help patients and riders climb onto the horse, with volunteers also assisting them. During riding sessions, “sidewalkers” accompany the rider to prevent falls and talk the rider through the motions. According to Equestrian Crossings Volunteer Coordinator Gail Corell, there are only a few programs in the United States that have participated in this kind of research. The significance riding can have on patients, however, is visible, she said. Horseback riding also builds core strength, as riders need to balance themselves as the horse moves its legs. Most importantly it stimulates the nervous system, which is essentially eaten away by the potentially disabling disease. Nervous systems tend to improve and renew after horseback riding, Corell said. One of the most important aspects of adaptive riding is the sensation riders experience when they make it to the top of the towering horse. The patients’ faces light up after the climb, often in disbelief. To have limited mobility, but sitting atop a massive 1000-pound animal is huge, according to Corell. Some laughed joyously, some shed tears.